Last Friday, as all eyes were focused on the assassination of Lebanon’s security chief Wissam al-Hassan, another explosion snuffed out a human life. An Israeli-launched cluster munition detonated as Ibrahim, a man who had been married for less than a month, was working in a field. According to Al Akhbar, Ibrahim died in hospital seven agonizing hours later. I’ll be following up on the circumstances surrounding Ibrahim’s death, but it appears he worked as a deminer. Israel, which often refers to itself as the ‘most moral army in the world’, dropped around one million cluster bombs over Lebanon in August 2006, mostly in the last few hours of the conflict when negotiations at the UN had made it apparent a ceasefire was imminent. Of those, up to four million submunitions (explosive bomblets within the cluster bomb) failed to detonate, remaining threats to civilians to this day. According to the watchdog organization Landmine and Cluster Munition Monitor (2011), by the end of 2010 there were at least 16,921 confirmed cluster munition casualties globally, though it believes the real figure may be as high as 54,000 because many incidents are never recorded. Injuries caused by cluster munitions, such as limb amputations, shrapnel wounds and blindness, have catastrophic and lifelong repercussions for victims. 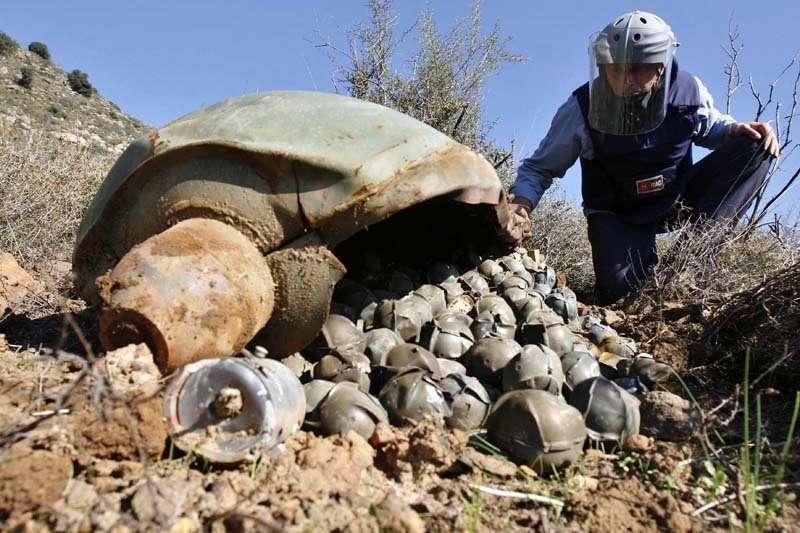 Cluster munitions impede the enjoyment of other rights, obstructing reconstruction efforts, hindering freedom of movement, preventing land from being used for livelihood activities, and locking affected communities in poverty for years after conflict ends. Israel’s use of cluster munitions in Lebanon provided a catalyst for diplomatic action to ban the bombs. On 30 May 2008, a total of 107 states formally adopted the 2008 Convention on Cluster Munitions. The number of signatories has risen to 111, but some of the world’s major users and producers of the weapon, such as Israel, the USA, Pakistan, India, China and Russia, have still not joined. Whatever weapons ‘experts’ say, there are no merits to cluster bombs. All they do is cause enormous human suffering, destruction and devastation. They are a form of collective punishment that go on killing and maiming years and even decades after a conflict ends. It’s about time they became a thing of the past. Don’t let Ibrahim’s death have been in vain. If you want to help clear landmines, cluster bombs and other explosive remnants of war, please think ofdonating to a mine clearance organisation. I am a longtime supporter of Mines Advisory Group, but any of the below are worthy of support.